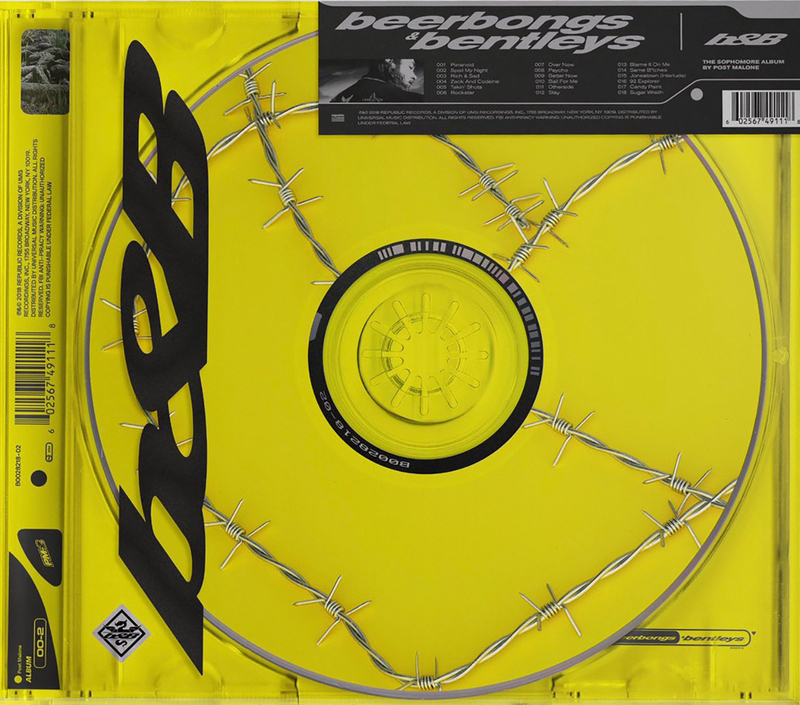 Money, women and paranoia are all delivered on a polished second album for Post Malone. Overnight success has taken Malone to a new kind of stardom, and beerbongs & bentleys is an exclusive, all-access pass into the underbelly of his journey. The album begins with “Paranoid,” a slow jam that depicts the feeling of being “aimed at” while at the top of charts. At first, the lyrics are a bit lofty and disconnected, and he does nothing to help ground them. So when he proclaims that he “never” knows “when someone comes and tries to take my life” so he’s “been sleeping with the .45 every night,” it falls flat because it seems contrived. But then there are some raw, seemingly truthful moments in the same song. “Sometimes I feel like I got no friends,” he sings in the second verse. “Can’t trust a soul, like I’m Snowden.” He even hits a lyrical high by saying “a paranoid man makes paranoid plans” in each chorus. The song feels more grounded when he uses his time to talk about the paranoia fame has brought him, but just as quickly as one connects to the real lyrics, he’s back to talking about blasting someone with his gun. The album follows along like this more or less lyrically. There are some surprisingly strong, honest, lyrical moments from Malone, but then the next few lines slap you back into reality. And in that reality, clearly, the lyrics aren’t the star as each song is introduced and then passes along to the next. The star is actually the production quality. Each song is a well-constructed melody. Malone’s producers and sound engineers have found a perfect balance in beats, synths and melodies to make it sound not complicated, but also interesting. And what’s most impressive is how Malone manages to be auto-tuned throughout the album but not come off as annoying. It’s just enough auto-tuned to help keep him on key but not so much that it becomes overbearing and too manufactured. This isn’t hip-hop caviar nor is it hip-hop that truly speaks to the soul. It’s just well-polished background music for working on homework or a project. It’s definitely worth that first listen to see glimpses of how fame has affected Malone’s life, but it’s not really enough to get the full scope of how fame, money and women have truly affected him.